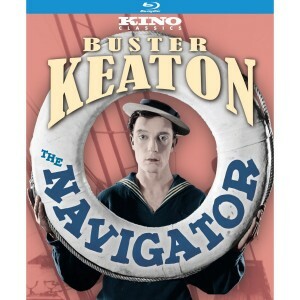 Buster Keaton’s ‘The Navigator’ Blu-Ray Announced and Detailed!!! Kino Classics is proud to announce the Blu-ray and DVD release of Buster Keaton’s The Navigator, widely recognized as one of the classics of silent screen comedy. Now, this acclaimed film makes its Blu-ray debut, mastered in HD from a 35mm negative from the Raymond Rohauer Collection, with color tinting according to the original specifications.The Navigator comes to Blu-ray and DVD on September 4th, with a SRP of $34.95 for the Blu-ray and $29.95 for the DVD edition. Both are currently available for pre-order. This edition from Kino Classics features musical accompaniment arranged and composed by Robert Israel (in 2.0 stereo and DTS-HD Master Audio 5.1), and comes packed with special features, including a featurette, written by film historian Bruce Lawton, about the making of the film and Keaton’s fascination with boats as sources of comedy; an audio commentary by silent film historians Robert Arkus and Yair Solan; a photo gallery; and audio of a 1913 recording of “Asleep in the Deep”, a popular song of the period referenced in the film. This is the tenth of Buster Keaton’s independently-produced feature-length comedies that Kino Classics has released on Blu-ray. Kino has also previously released all 19 of his silent short comedies on Blu-ray, as well as the 16 talkie shorts Keaton made for Educational Pictures in the 1930s. A precursor to his classic The General – only centered around a 500-foot steamship rather than a Civil War locomotive – The Navigator demonstrates Buster Keaton’s ability to transform complex machinery into large-scale comedy props. In a return to the “pampered youth” role he had played in The Saphead, and would play again two years later in Battling Butler, Keaton stars as Rollo Treadway, an inexperienced lad of extraordinary wealth (and surprisingly little common sense) who finds himself adrift on the Navigator with no one else on board except an equally naive girl. After discovering each other’s presence in an ingenious ballet of unintentional hide-and-seek, the couple resourcefully fashion a home for themselves aboard the derelict boat, in spite of their unfamiliarity with the tools of domesticity. A series of mis-adventures ensue: on the high seas, on the ocean floor, and in the face of a fleet of angry head-hunters. The Navigator was co-directed by Buster Keaton and Donald Crisp, and was shot largely on board the Buford, an ocean liner which Keaton and his art director arranged to use for the filming of this picture. When the film was first released in 1924, it contained color tinting, which has been restored to this edition according to the original specifications. This entry was posted on Monday, August 20th, 2012 at 4:28 pm	and is filed under Film, News. You can follow any responses to this entry through the RSS 2.0 feed. You can skip to the end and leave a response. Pinging is currently not allowed. « Mike’s Summerslam 2012 Results and Review!!! The Good, The Bad, and The Ugly!!! You said you 'n' me was gonna get out of town and for once just really let our hair down. Well darlin', look out 'cause my hair is comin' down!